Talking about the latest Criterion DVD release has already landed me in a dustup, so I tread with caution. On Facebook I said the movie was a curio, not a lost classic. That prompted a critic whose work I regularly read to call me a ... well, the exact name was left vague but I’ll go with the most positive option and say philistine. The critic ultimately kicked me to the digital curb. Maybe Errol Morris is right when he suggests that social media is as bad as high school. Bigger Than Life generated an uncommon amount of publicity when it debuted on video last week. The majority of reviews were laudatory; the word “masterpiece” crops up repeatedly. It was hailed as a neglected landmark, an incisive social critique, a scathing exposé of the American Dream. All of which should have raised red flags. I don’t have many rules when it comes to movies, but here’s one: when every hosanna fawns over what a movie says but not what actually happens onscreen, odds are you’re in for a tough sit. Nicholas Ray directs. The movie is based on a New Yorker article and feels like it. James Mason plays a mild-mannered schoolteacher who moonlights as a taxi dispatcher. He suffers from increasingly frequent bouts of pain which are diagnosed as a symptom of a fatal arterial disease. But there’s a new treatment, the miracle drug cortisone. It saves Mason’s life, but also triggers manic episodes that crescendo into full-blown psychosis with his abuse of the drug. He becomes a suburban Nietzsche, a household tyrant terrorizing his family. The lopsided script is so focused on Mason and his largely one note fugues that the behavior of the other characters is rendered incomprehensible. His doctors aren’t held to account. As for Mason’s wife (Barbara Rush), I had to keep stepping out of the movie to backtrack her motivations. “I suppose if she thinks X, it makes sense she’d do Y.” Many critics claim Bigger Than Life is fundamentally about issues of class – novelist Jonathan Lethem, a great admirer of the film, offers 27 minutes of cultural background on the DVD – but the movie treats money obliquely. In a key scene, Mason holds up medical bills shot in such a way that I couldn’t tell what they were until he’d already put them down. Here’s another of my rules: if your characters’ actions are essentially prompted by subtext, you’ve failed as a dramatist. I was interested enough in the story to track down the original article in the New Yorker’s archives. Berton Roueché’s “Ten Feet Tall,” published in September 1955, is an astonishing piece of reportage that answered every question raised by Bigger Than Life’s flawed script. To begin with, the schoolteacher’s wife has a far more substantial presence. During the period in question, she herself was incapacitated by sickness. Her husband’s adverse reaction to cortisone was compounded by his doctor’s refusal to discuss why he was altering the dosage. Here’s the teacher on his physician: “He believes in a minimum of explanation and a maximum of results. And, of course, I said nothing to my wife.” The bath scene that gives the movie its signature image – Mason’s reflection in a shattered mirror – comes from out of left field in the film. The incident in context is smaller and far more devastating. Roueché’s article is a case study. 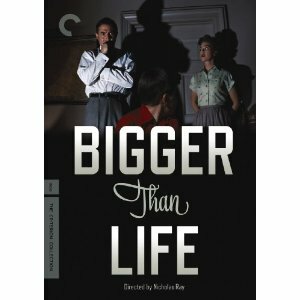 So is Bigger Than Life, in how not to adapt material. UPDATE: Jaime Weinman offers a terrific counterpoint to this post.